Our new 18" wide x 32" long Crumb Catcher Adult Bib features a blue yellow checkered pattern. 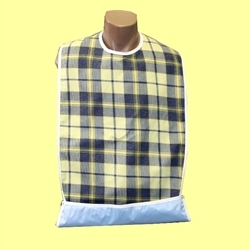 It also has a full waterproof back barrier and an easy to use snap neck closure. This bib is longer than many other styles and it will accommodate a larger person. The length also makes it a perfect bib to provide protection to the lap area from spills.